The Decoy Raft TM Waterfowl Platform is a truly unique and revolutionary product unlike anything that exists in the waterfowl market today. 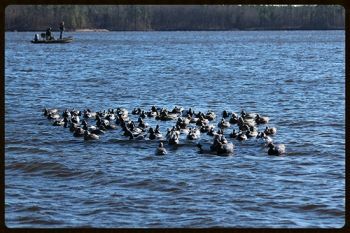 The Decoy Raft provides a platform that allows the hunter to deploy and retrieve multiple dozens (100+) of decoys in minutes using as little as one anchor. The Decoy Raft is effective in any water depth, regardless of current and wind. The Decoy Raft provides the hunter with decoy spread versatility unmatched by conventional rigging methods, and quickly establishes itself as an irreplaceable necessity for the serious waterfowler. Please visit our website for videos, instructions, and ordering information on the Decoy Raft Waterfowl Platform.